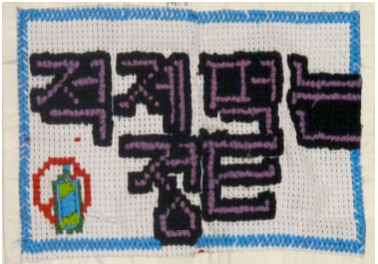 Brooklyn students embroider their ideas: Part 16 | Be Nice. Nina, you have a great attitude and should be really proud of yourself! I can tell you from experience that when I started to eat healthier, I felt a lot more confident because I was achieving my goal. Your focus on being healthy is really admirable. And your piece looks marvelous! I’m so glad you liked the project Jessica–it looks great! 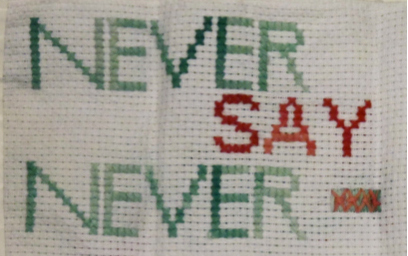 I hope you keep cross stitching if it’s something you continue to enjoy! Sebastian this looks great and you are right: splitting threads is trying on one’s patience sometimes. My husband loves the back of my embroideries too–the “map” the threads make as they overlap and criss-cross each other is really beautiful! I’m glad you liked the outcome of your project. I love reading all this… it is so cool to hear other peoples ideas, thoughts, reasonings, and opinions. I just really enjoy people being real and this is REAL… you all have done awesome work on this whole project! I look forward to more of it all! !